A plaque which was at the base of tree planted to commemorate those who served with the 4th Light Horse Regiment of World War One. The tree was planted by Mr. J.B. Payte on the 4th August 1934 and was No. 99 in the ballot. 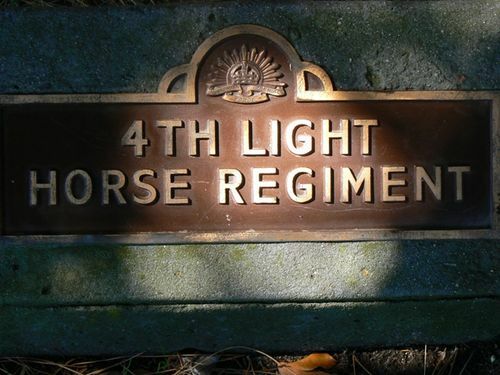 The 4th Light Horse Regiment was a mounted infantry regiment of the Australian Army during the First World War. The regiment was raised in August 1914, as the divisional cavalry regiment for the 1st Division. The regiment fought against the forces of the German Empire and the Ottoman Empire, in Egypt, at Gallipoli, on the Western front, on the Sinai Peninsula, and in Palestine and Jordan.